Amber Bannon is a Senior Technical Specialist at the Environment Agency. Here she writes about her new post at the Society for Radiological Protection. On 26 April I'll become the youngest President-Elect of the Society for Radiological Protection (SRP) in preparation for a full two year Presidency from April 2017. The Society for Radiological Protection is the UK’s chartered radiation protection society, with members from all sectors of UK industry. I've been a member since 2007 and am currently the Honorary Secretary. In my new role I'm going to be the SRP's public face and will be promoting its strategy and policies. I'm really looking forward to encouraging young people, and women in particular, into physics and radiation protection. The Environment Agency has supported and encouraged my involvement with SRP, acknowledging the opportunities for technical and personal development as well as networking opportunities with other radiation protection professionals. I've had the opportunity to get involved in areas that I wouldn’t normally come across in my role as a Technical Specialist for radioactive substances in the non-nuclear sector. Recently I helped out on the SRP's stand at the Big Bang Fair. 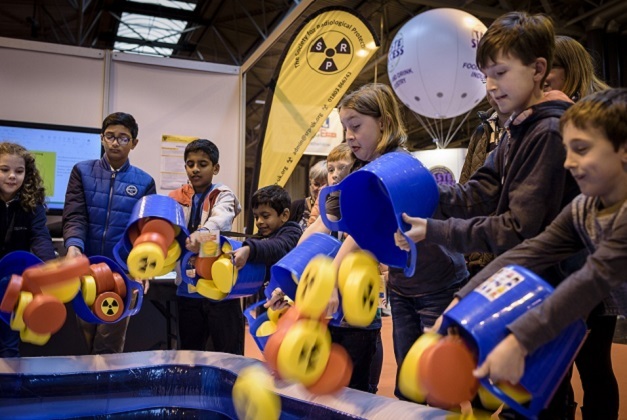 The Big Bang Fair is an annual event, the largest UK exhibition of interactive workshops and exhibits and exciting theatre shows for young people interested in science, technology, engineering and maths (STEM). 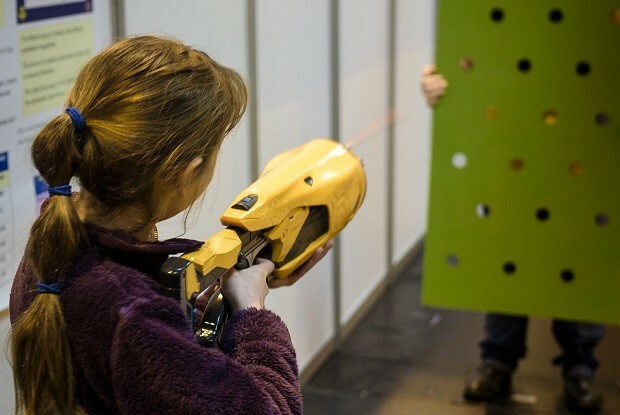 It ran from 16-19 March at the NEC in Birmingham, with an estimated 70,000 young people visiting over 4 days. The SRP stand was very popular and we had 3 fantastic interactive exhibits. You can see photos of the exhibits and me in action on SRP's Facebook page. We used a paddling pool and frisbees to demonstrate radioactive half-life. Half-life is the time taken for half the radioactive nuclei in a sample to decay. And we used a Nerf gun to demonstrate how to reduce the radiation dose received. A table of everyday radioactive items was a good talking point too. Visitors could use a monitor and see the difference in how much radioactivity is present in Brazil nuts, Lo-salt, household smoke alarms and an old watch with a radio-luminised dial. The opportunity to interact with the visitors, young people, parents and teachers alike, was incredible. The enthusiasm and excitement for understanding the science of radiation protection was infectious; by the end of my two days I was shattered but inspired to do it again, even if the price to pay is a doubling of my laughter lines! Resources for schools are available on SRP's website. Find out more about the Environment Agency's role in monitoring radiation in the environment.